The Intestinal Kit provides the foundation for achieving optimal intestinal health. 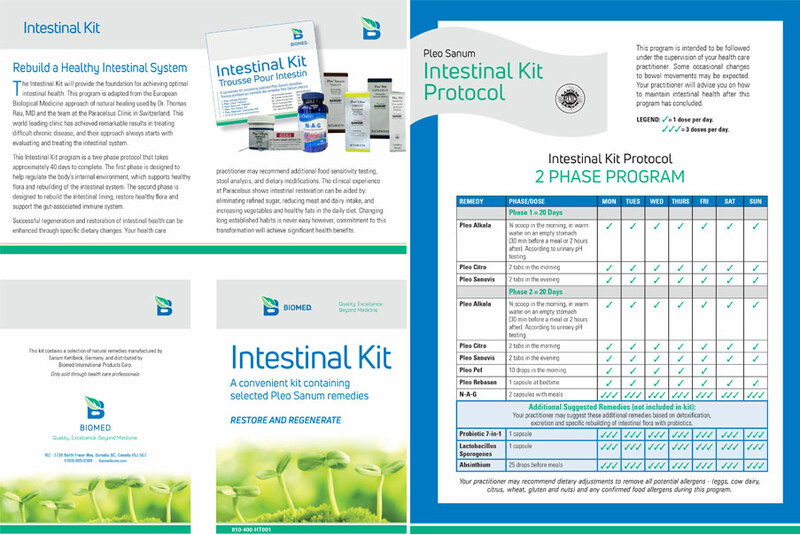 The Intestinal Kit program is adapted from the Swiss Biological Medicine approach of natural healing used by Dr. Thomas Rau, MD and the team at Paracelsus Clinic in Switzerland. This world-leading natural medicine centre has achieved remarkable results addressing difficult chronic disease, and their programs always start with regeneration and restoration of a healthy intestinal system. Healing the gut is important in cases of gastrointestinal symptoms, leaky gut, dysbiosis and candidiasis, allergies, immune conditions, chronic infections, inflammation, fatigue, respiratory conditions, sinusitis, skin conditions, metabolic disorders, malignancy, and joint disorders. This Intestinal Kit approach leads to a healthy digestive tract with balanced intestinal flora, proper digestion, a strong immune system, and recovery from chronic disease and illness. NAG capsules – repairs and rebuilds intestinal mucous membrane lining.